It is a material composed of a technological concept totally different to the asbestos-based products, chrosidolite as well as chrysolite asbestors. This material aims at solving the area of laminate sheets and parts which must operate at high temperatures and electric arc safely, due to particular service conditions. Mechanically it allows any kind of precessing, drilling, turning, milling, and grinding. It can also be used for coating metals of various compositions with excellent adhesion. – Specific gravity: 1.85 +/- 0.05 g/cm3. – Arc resistance: it complies. – Ionization test: it complies. – Color: salmon-pink or beige. – 500 x 1000mm and 500 x 600 mm laminate sheets. – Rolls of material between polyethylene bags for compression molding. 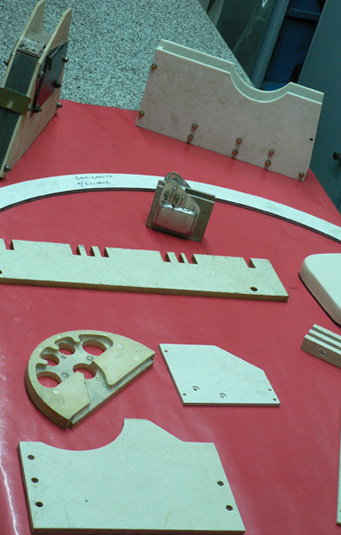 – In already molded and/or tooling pieces, according to particular customer’s sketch or layout. .